Based around the classic card game rules for Go Fish, Go Fish Fitness is a card game for kids to encourage them to get up, jump around, and add a component of physical exercise to their game in a fun and competitive way. Each card denomination includes a quick physical exercise, players compete to make a match and force their opponents to do the activity. 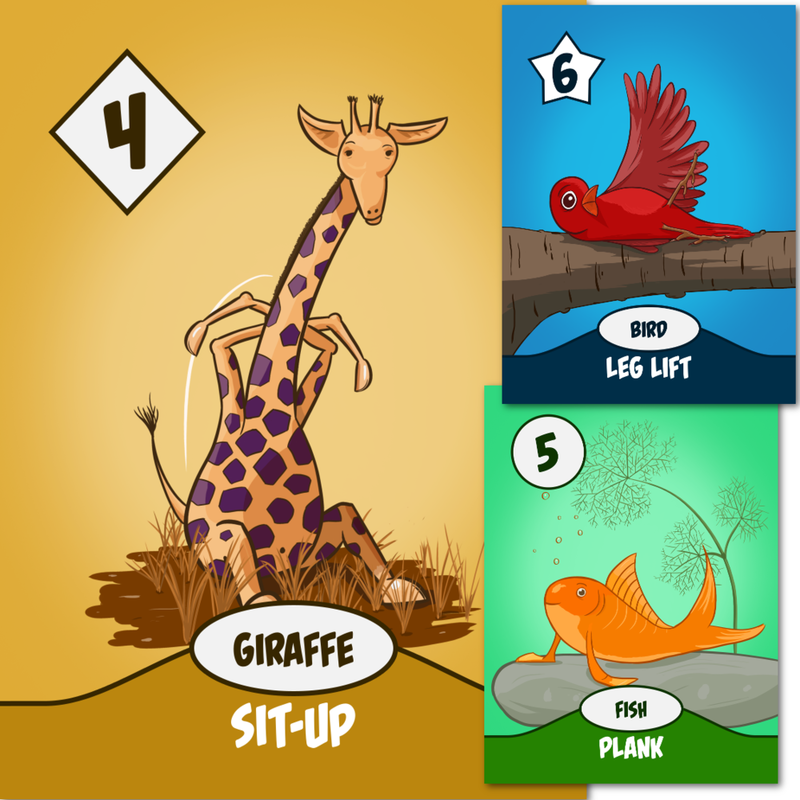 In addition to exercises, each card includes an animal or a creature so that younger children, and children unable to complete the exercises, can participate by mimicking the shown creature when a match is made. Go Fish Fitness is based around the same set of cards as a standard deck, and can be incorporated into many other standard card games as well. Keeping fit is about incorporating exercise into everyday life, in ways both big and small, and Go Fish Fitness is a way to introduce a little bit more exercise into a normally passive activity for your kids! Go Fish Fitness is a collaboration between Tricorn Games and Fredrik Skarstedt to produce the images and design for the game. Fredrik is an fantastic artist with a fun and whimsical style that connects amazingly well with children. Go Fish Fitness uses the standard rules for a game of Go Fish or any variant you choose. When a player makes a pair by asking for a card from another player or successfully drawing the desired card from the Pond, all other players at the table must get up and perform the exercise described on the card. The number of repetitions or duration of the exercise is the number on the card (Ex. 10 Jumping Jacks, or a 5-second Plank). Younger players or players with limited mobility may instead pretend to be the animal pictured on the card in whatever way they choose. Each player is dealt 5 cards with the remainder scattered in the middle randomly (the "Pond"). A player takes their turn by asking another player for a card of a specific value that they already have at least one of (Ex. If Alice has a three, she may ask "Bob, do you have any threes?"). The other player must hand over any cards of that number that they have. If they do not have any they tell the asking player to "Go Fish" who then must draw a card from the Pond and place it in their hand. The asking player places any pairs they have on the table. If a pair matches the requested card all other players must now do the exercise and the player takes another turn. If a player runs out of cards they may draw five more from the Pond. Once all pairs have been found the player with the most pairs wins. 1 - Only the person who hands over a requested card does the exercise. 2 - Only the player who makes the match does the exercise. 3 - A player may skip doing an exercise, but must return and shuffle one of their pairs back into the Pond or lose their next turn. Go Fish Fitness is based on a standard 52-card deck where 11=J, 12=Q, 13=K, Ladybug/Rules=Joker, and the Squares/Stars suits represent Clubs/Spades respectively. The game may be adapted to include fitness components into any other matching or trick taking game of your choice. Kickstarter: Go Fish Fitness was successfully funded on April 6th, 2017 and delivered to backers on June 1st, 2017.